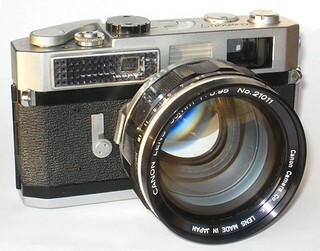 The Canon 7 is a 35 mm coupled rangefinder camera made by Canon in 1961: the same year as the Canonet. It followed the Canon VI and Canon P.
It was the first of Canon's rangefinder cameras to have a built-in lightmeter. This is a dual-range selenium meter (the low range is EV 6-13 at ISO 100, and the high range EV 12-19): the range is selected with the small knurled knob beside the finder eyepiece, to show either a black dot (low sensitivity; i.e. high EV) or an orange one (high sensitivity) in the hole above the knob. The meter is coupled to the shutter speed dial, which incorporates the film-speed dial. The meter indicator is a needle pointing to aperture values in the centre of the top plate. The camera has a focal plane shutter with metal curtains, travelling horizontally. This has speeds 1 - 1/1000 second, plus 'B', 'T' and an 'X' position for flash synchronisation at 1/60 second. The synchronisation is by a PC socket on the left-hand end of the top housing. In order to accommodate the meter in the top housing, there is no built-in flash shoe. The viewfinder has brightline frames for 35, 50, 85 and 135 mm lenses; one of these is selected with a dial on the top plate. The finder has automatic parallax correction. Film advance is by a lever, and there is a frame counter, which resets automatically when the back is opened. Rewind is by a folding crank; the film is released for rewinding in the 'R' position of the collar round the shutter release button. The back opens with a catch on the left hand end, but there is also a lock on the bottom of the camera. There is a self-timer on the front of the body. The camera was made in silver and, much less commonly, black finish. The Canon 7 has no accessory shoe, despite the need for one for any lens wider than 35 mm. The solution is an "accessory coupler", specific to this model. The coupler attaches to the bayonet flash socket to the left of the camera (as held for use), and itself has an external bayonet flash socket. It brings the accessory shoe over the centre of the camera. Users (or collectors) of this camera outside Japan tend to complain about the rarity and price of the accessory coupler but it is easily found in Japan. 137,250 examples of the Canon 7 were manufactured, far more than any other model: 87,875 of the "popular" model Canon P were made, and only 20,000 or so of the Canon 7s (the successor to the Canon 7) were manufactured. ↑ Canon 7 at the Canon Camera Museum: the source for most of the information here. ↑ User's manual at Mike Butkus' Orphan Cameras. ↑ Dechert, Peter. Canon Rangefinder Cameras 1933–68. Hove, East Sussex: Hove Foto Books, 1985. ISBN 0-906447-30-5. P.186. ↑ Dechert, Peter. Canon Rangefinder Cameras 1933–68. Hove, East Sussex: Hove Foto Books, 1985. ISBN 0-906447-30-5. P.182. ↑ Dechert, Peter. Canon Rangefinder Cameras 1933–68. Hove, East Sussex: Hove Foto Books, 1985. ISBN 0-906447-30-5. Pp. 192, 196. Canon 7 serial no. 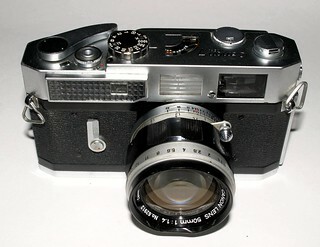 886431, with the 50 mm f/0.95 lens, sold in the twentieth Westlicht Photographica Auction, on 1 November 2011.